The right inspection camera can be a critical asset to any number of tough jobs. The question is, which inspection camera is right for you? Since inspection cameras come in a wide variety of sizes and specifications, the task of finding the specific one you’re looking for can seem a bit overwhelming. From industrial borescopes with video screens to mini smartphone or USB compatible devices that are easy to carry, these cameras are capable of dramatically simplifying any number of complex situations. 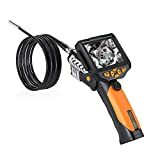 Feel free to take a look at these in-depth inspection camera reviews so that you can confidently decide for yourself which is the best inspection camera for your individual needs. When an inspection job is complicated or you find yourself pressed for time in your field of work, searching for all of the accessories, components, and add-ons that you need for your inspection camera, can be a legitimate hassle. The DEWALT 12V MAX inspection camera kit saves you time, energy, and money by including everything you need in a convenient, easy-access kit. The camera is simple to operate and the included kit comes with multiple critical components as well as a few extras. You can spend less time on a quest for compatible equipment and more time finishing the actual job. The camera itself gives you visual access to all of those hidden nooks and crannies through a detachable screen with a MicroSD card for easy viewing. A 3-foot snake pushes the camera around corners and inside of tight spaces that would be otherwise totally inaccessible. The camera’s 12-volt lithium ion battery quickly recharges so you won’t have to worry about bringing along extension cords or tracking down a viable electrical outlet. 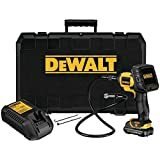 The Dewalt Inspection camera kit available on Amazon also includes a hook and magnet for the retrieval of dropped items. The full kit includes a snake inspection camera with lithium-ion battery and detachable screen, charger, hook, magnet, MicroSD card, carrying case, and a three-year limited warranty. On the downside, with a kit, you don’t exactly get to customize the accessories that are included. Full kit- This camera kit has everything you’ll need to get started. Detachable screen – Detachable 3.5-inch LCD screen for convenience. Hook and magnet – Hook and magnet attachment make lost item retrieval easy. Warranty – A three-year limited warranty and 90-day money back guarantee means less stress. Non-customizable – This kit doesn’t leave much room for custom additions later on. Verdict: This is a great basic camera kit for those who wish to get started inspecting the unexpected immediately. It comes with the camera, charger, battery, carrying case, and some additional convenient attachments, all for an okay price considering the DEWALT brand. On the downside, with a kit like this, you lose out on the ability to slowly build up your gear case with custom attachments and components. 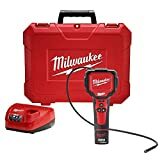 All in all, this is a great inspection camera starter kit that can help you avoid the aggravation of finding components that fit properly and are compatible. Attempting to orient an image on a display screen so that you can view it easily while in the middle of a job can be annoying. This inspection camera takes the frustration out of the image viewing process. This ground-breaking LCD display system rotates so that you can orient an image properly without the cable getting in the way. It also comes as part of a full kit so you don’t have to run around looking for the right charger or battery pack. A 640 x 480 digital image sensor and bright LED lights let you get a clear view of whatever you’re looking at. The whole kit includes the rotating camera, its carrying case, charging station, hook and magnet attachments for item retrieval, a mirror for extended viewing, and a 5-year warranty. The display resolution of the camera is 320 x 240 pixels. As far as drawbacks go, the display screen size isn’t great. For only a little bit more, you could get a larger screen. Also, while the screen rotates, many cameras now have detachable screens that are easier to use which makes this inspection camera feel a bit outdated. Compact – Entire system is compact and easy to store. Screen rotates – Rotation of the screen can come in handy in many situations. Full kit – Kit includes the charging station, attachments, case, and camera. Durable – The whole kit is really durable and seems to be quality made. Simple – This is a simple to use and very easy to operate camera option. Bright lighting – Attached LED lights really come in handy. Somewhat outdated – This kind of inspection camera is a bit outdated. No recording – There’s no way to record what you’re looking at as far as we can tell. Verdict: This kit is great for those who are used to operating these kinds of cameras and aren’t interested in switching things up. It’s like an extension of your vision for tight spaces. It’s also a really durable option. The rotating screen is nice, but these days you can get a detachable screen that can be viewed at a distance. For DIY projects or fishing a wedding ring out of a drain, this would be a pretty good choice. For constant industrial use, you might want something a bit more complex. At the end of the day, it’s a super simple and dependable short range inspection camera. Teslong has been making classic endoscopes for quite some time now. This means that they know exactly what industrial professionals really need in an inspection camera. This is a great option for mechanical applications, especially in the automotive industry. It can also help with pipe repair, home maintenance and much more. It’s a probe camera with a better diameter than you’d expect: 5.5mm (0.21 inch); it can really get into those narrow spaces and difficult to access crevices. It’s also made of high-quality materials and equipped with a 3.5-inch QVGA color LCD display screen. You can use it right out of the box, it doesn’t have any complicated software or necessary application integration; a bonus for some and a drawback for others. A one-year warranty is included as well. Other useful features include the semi-rigid cable, waterproof design, 6 super-bright and adjustable LED lights, an AV-out component, 8GB TF-card, photo and video capabilities, 1Wcree flash, and multiple aluminum alloy accessories. Another bonus is the price, it comes at an impressively good value. Versatile – This is the type of inspection camera that can be used in many fields. Waterproof – An IP67 waterproof rating will be crucial for some users. Picture and video – Captures images and video easily. Fixed local length – The depth of focus is between 3 to 6-cm and can be automatically modified. Dynamic size – Diameter of 5.5mm easily enters super small spaces. The screen is NOT waterproof – The handle, screen, and joints of the probe must stay dry. Pin weakness – The pins may bend and cause the picture to disconnect until straightened. Verdict: This is a great industrial camera that can be used in numerous ways. 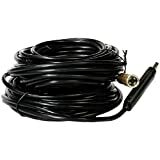 Ideal for mechanics and other professionals who need to see into tight spaces, this versatile endoscope is a really great tool that can make life simpler for a very reasonable price. On the downside, it has some weak spots and isn’t as durable as many would prefer; the screen must stay dry and the pins can disconnect. Still, for the price, it’s a pretty impressive option. 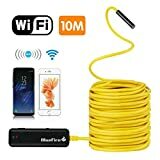 This is a simply upgraded wifi endoscope that will not only work with Apple products, but with other smart devices like Android or Samsung smartphones and tablets. They must run off of IOS 6.0 systems or higher- for Android, 8.0 or higher. The wireless setup is pretty simple, you just connect after downloading the application for each specific device. Wifi is necessary for connection. Besides the technology, you get 11.5-FT of semi-rigid cable. This allows you to get a pretty extensive view of whatever crevice you’re crawling around in. This is a great product for recreational or DIY use. The camera has a resolution of 1280×720/640×480/320×240, a diameter of 8.5mm, and is IP67 waterproof. The wifi transmission distance is a solid 35 feet and the battery capacity rating is 1800mAh. The kit includes the camera, batteries, 11.5-FT cable, and instruction manual. 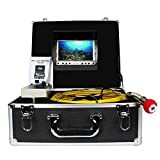 Listed applications of this endoscope are cleaning, item location, small object repair, science education, aquatic observation, and other explorative activity. It seems like a good recreational option that comes at a super low price. Low price – This is one of the less expensive options. Long – The 11.5-FT of length is a bonus. Works with iPhone – This product works better with Apple products than some competitors. Great for recreation – This is a good recreational option. Quality – In its class, this is one of the more quality built options. Waterproof – IP67 waterproofing means you can use this endoscope for fish tanks. Not for professional use – This is more of a home use endoscope. Verdict: On the whole, this is a pretty decent at home endoscope option that comes at a good price and is of quality build. You could use it for cleaning, in the classroom, or for other recreational exploration situations. It’s not the best product for professional use. You also have to download an application for your smart device before you can use it. Teslong has been pioneering inspection camera designs for quite some time now. Their new industrial borescope is proof of their innovation and progressiveness. This particular endoscopic inspection camera has an improved probe camera diameter so you’ll have more versatility than ever before. This microprobe camera is minuscule, measuring in at only 5.5 mm or 0.21-inches total, making it ideal for reaching deep into tight spaces. Additionally, this particular camera allows you to view images in real time. You’ll see immediate projections clearly on the 3.5-inch QVGA color LCD screen. The LCD is perfect for those who don’t want to download any software. You can use the came right away without downloading programs on your phone or computer, a definite bonus. The high-quality metal gooseneck is extremely flexible while still managing to stay rigid enough to push into crevices and around corners. A built-in Samsung Lithium-ion battery operates at 2600mAh capacity, meaning you’ll have around 6 hours of operation time per charge. Accessories included with this camera are the LCD screen, a mirror, hook, magnet, user manual, and rigid carrying case. It also comes with a 12-month warranty. All around, this is a great camera for home or professional use. The only downside with this camera is that the focal point is somewhat misaligned; it’s further down the barrel so the area right in front of the camera is not in focus. You’ll have to wiggle it around a bit from time to time to get the picture to straighten up or clarify. Other than that, this is a solid camera that serves multiple functions. Waterproof – Ideal for plumbing for fishing in a drain. Micro Camera – Fits in small spaces with ease. Rigid Metal Gooseneck – Great for corners and crevices. Record And Playback – Records and plays back pictures and videos easily. Focal Point Issues – The focal point of the micro camera is a bit off. Verdict: This is an awesome camera that can be used at home or by professionals. It’s really small, totally waterproof, and has a flexible yet rigid gooseneck that does a great job of getting the camera where it needs to be. It also includes all of the necessary accessories, a warranty, and a carrying case. The only disadvantage of this camera is the focal point alignment. You may have to move past an object to see it clearly. Other than that, this is a great option that comes at a very reasonable price. What’s great about this very affordable inspection camera is its ability to work with so many smart devices. Not only will it work with an iPhone or Android smartphone, but it also works well with Samsung devices and Tablets. 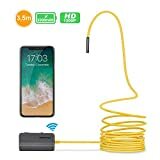 It’s a wireless wifi endoscope camera that is awesome for anyone who wants to do inspection work quickly without investing too terribly much financially. It’s also a pretty durable little device. Unique Blue LED technology improves image quality drastically while an 11.5-FT cable is waterproof and super flexible. It holds its shape well also, so as you snake it around corners and through cracks, it pushes forward with ease. An integrated second generation chip at 30fps acquires smooth video and clear images quickly. This gives it a distinct advantage over other 10fps chips on the market. Its waterproof rating is another handy feature. On the downside, this camera doesn’t work well with older software. To use it, you’ll have to have an IOS system that operates at 8.0 or above. It also has to be connected to your phone with wifi instead of with an app. This is both an advantage and a drawback, depending on your situation. Since it’s an attachment of sorts, you’ll find that this is a really inexpensive option as well. Innovative – New technology saves you time and money. Versatile – As long as you have wifi, this is a multifunctional and versatile option. Extended length – The 11.5-FT of extent range is pretty useful. Multi-device – It’s compatible with many smart devices. Quality made – This is a quality waterproof option. Inexpensive – It won’t hurt your wallet very much. Must be updated – This camera extension will not work with older devices or outdated software. Wifi needed – It absolutely won’t work without wifi. Verdict: If you want something that’s inexpensive and can be used with a smart device, this is a great choice. It doesn’t compare to higher end, professional inspection cameras but it can do the job. It also doesn’t run off of an app so you can connect it to a variety of devices as long as you have wifi. Unfortunately, if you don’t have access to wifi, this camera won’t work. This means that it’s not a good candidate for work on a job site or out in the field. Still, for DIY repair work, home use, or certain other working purposes, this is a good option. If you’re tired of renting equipment and are ready to get your own professional inspections system, this may be one of the best solutions out there. For the same money as what many will pay to rent an inspection system like this for one single job, you can own this professional piece of kit that includes all of the necessary components and accessories. Use it to see into gutters, chimneys, the depths of a pond or lake, floor spaces, the inside of your own walls, an attic for termites or pests, places where hidden corrosion exists, and more. It’s the real deal and comes with a fully submersible waterproof camera, gigantic crystal clear 7-inch display screen with TFT LCD DVR, 4000mAh Li-on battery, charging components, and heavy-duty padded aluminum case. This product also offers a customer support line which can be very helpful if you run into issues of any kind. This is a premium professional system that can solve real issues in a variety of industrial or home situations. On the other hand, it’s kind of expensive. You could get an attachment camera for your smartphone that would be fine for looking down a drain or inside of an anthill for much less. So, if you aren’t planning on using this thing regularly, the learning curve and price point are both a bit steep. However, if you are planning on using this system on a regular basis or have been paying to rent similar systems, it’s a great option that comes at a very fair price all things considered. Professional – This is the kind of system that can be used continuously by industry professionals. Huge display – The 7-inch LCD monitor is a great bonus. Padded case – The case of this system is particularly nice. IP68 Waterproof – You could potentially look for sunken treasure with the waterproof camera. Long battery life – Get up to 12-hours of battery use from one full charge. Expensive – If you aren’t planning on using this regularly, it’s a bit spendy. Verdict: If you’re needing a professional Endoscope system that can be used continuously and has a gigantic display, this is probably the best candidate on our list. It’s durable, waterproof, made with premium materials, and designed for professional industry use. It’s a great way to save money on system rental and can solve an abundance of problems. If you aren’t looking for something this high-end though, there are definitely some cheaper options out there. A newer product, this endoscope is compatible with all of the latest smart devices. This includes most Android, iOS, Samsung, iPhone, iPad, and tablet devices and systems. It has all of the newest technology and connects quickly and easily so you can accomplish whatever job is at hand. It has a semi-rigid cable that lets it navigate corners and turns easily. It also has an awesome HD camera that gives you clear and rich images and video with good color. This is one of the better smart device endoscope options currently available. It is significantly more reliable than certain other products in its competitive segment. It would work well for industrial use such as in the automotive industry, or for at home repairs. It’s also great for cleaning and finding lost objects. Helpful features include CMOS HD camera, the 3 adjustable resolution settings, the 6 adjustable LED lights, and the ergonomic design. It also features its own wifi Signal and a very handy built-in Li-ION rechargeable battery. The QR code scannable manual is also really useful. User-friendly – QR code scanning and a well thought out design make this a user-friendly option. Great camera – The HD camera works very well. Semi-rigid cable – The semi-rigid cable is stronger and more flexible than what you may find in similar products. Reported defects – Battery and switch defects have been reported with this product. Verdict: This is a multi-functional endoscope option that has been designed with users in mind. It doesn’t take long to hook up and use and has a clear and crisp HD output. On the downside, there have been defects reported with the batteries and on/off switch. Luckily, the company offers to refund and replace defective batteries so it’s not too big of an issue. All around, a good smartphone inspection camera option. This is a super long cable inspection camera that can be hooked up via USB. It’s priced fairly and completely waterproof. No software is needed, you just plug it in and let it work. You plug it into the USB port of a computer and can immediately begin looking at video and images. It is waterproof and durable with a flexible design that can extend to great lengths. Snake it through sink or shower drains, down rain gutters, into the tailpipe of an automobile, and more. It also comes with installation software for advanced features like recording and image capturing. This seems to be the kind of camera for individuals who already possess some extent of technical expertise. We recommend it for more advanced users or users who are willing to take the time to learn its ins and outs as some technical difficulties were reported at the time of this review. Affordable – This is an inexpensive option. Cable – Flexible cable is easy to snake. USB Connection – Connects easily via a standard USB port. May require technical experience – Some technical experience with computers may be needed to access all of this camera’s features. Verdict: This is an inexpensive snake camera that can be used to inspect a variety of small dark spaces. It has nice LED lights and a high resolution 1/6 CMOS camera for crisp clear full-color images. On the downside, if you want to record video or make notes while viewing spaces, you may need to have some pre-existing computer knowledge or the willingness to learn a new program. Now we will answer some of the most commonly asked questions about inspection cameras and how to choose the ideal one for you. How to choose the right inspection camera for your individual applications? So how exactly do you find the right inspection camera for you? Well, there are a few things that you should probably take into consideration as you shop. Knowing what to look for can enormously simplify your shopping process. How large will you need your video screen to be? Display screen size will vary depending on the device you choose. Some inspection cameras are designed to transmit wirelessly to a remote screen, while others attach directly to the cable and camera. The way that a screen attaches can impact its size. Consider your individual limitations. If you are farsighted, for instance, you may want to find something that will either transmit to a projection screen or easily connect to a large LCD screen. Depending on where you will be searching, the diameter of your camera head can be a big deal. If you need to get into small spaces, cracks, or crevices, you may need a mini inspection camera. For most inspection cameras, 8mm is the standard size. Measurements of a camera head of 5.5mm and below are considered micro. Will your camera need LED lighting? If you’re going to be looking in dark spaces, the answer will be yes. To be honest, most cameras will require LED lights. Otherwise, how will you see in poorly lit areas? Consider how much you’ll need when it comes to LED illumination. Generally, cameras will have 2, 4, or 6 LED lights. Some LED lights will turn on and off while other LED attachments will be adjustable. LED size can impact the diameter of your camera head, so keep this in mind as well. If your cable is too short, you may have difficulty accessing certain spaces. Decide if you would prefer a built-in battery, removable/replaceable battery, or wall powered unit. How much battery life will you need? The maximum battery life seems to be around 12 hours for inspection cameras. Some cameras do not have full-color imaging, though, though these days, most do. Above all, look for a camera that will work for you as an individual. There are many different inspection cameras out there and they’ve all been designed with specific tasks in mind. Know your task and you’ll be able to find your camera. Which inspection cameras are recommended for automotive work? There are a few inspection cameras that will work particularly well for automotive work. Generally, an inspection camera will be good in the automotive industry if it has the following qualities. For extensive automotive repair, the cable must be of sufficient length. To get around complicated automotive systems, s camera must be flexible and easy to maneuver. If the camera head is too large, it may become stuck or be otherwise incapable of passing through small places. Automotive cameras should be durable and reliable. It has a detachable screen and reliable wireless connection. It’s also very flexible. What is the difference between an endoscope and a borescope? The outer diameter of an endoscope is thinner than that of a borescope. The endoscope allows gliding while a borescope can vary to correspond with the angle or space it is fitting through. Endoscopes are generally more flexible than borescopes, while borescopes are great for areas where a rigid design may be needed. What’s the best simple “snake” camera to connect to an iPhone? If you need a snake or flexible cable style camera for your iPhone or smartphone, there are a lot of great options out there. 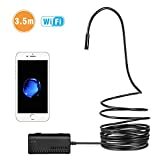 The simplest snake style cable iPhone camera is most likely the Depstech Wi-Fi Endoscope. Its design is better suited to the iPhone platform and it connects over any local wireless network. Additionally, this snake camera can give you 33 feet of reach and has an IP67 waterproof rating. So there you have it! 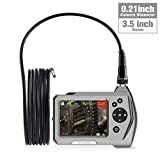 Some of the best endoscope and borescope inspection cameras currently available. From simple classic options to high-end professional grade products, these are some of the best inspection cameras out there on the market today. We are curious to find out which cameras have worked best for you. Which products do you recommend? Are there any details that we are missing that could simplify the search process for other buyers? Are there any smartphone integrated endoscopes that have you found particularly useful? Do you have a favorite industrial or automotive camera that’s missing from this list? Please feel free to leave us your feedback and share your experience, we’re looking forward to your comments.